I wanted to make affiliates and affiliate managers/programs aware of Jon and Derek, two affiliates within the industry. These guys think it’s okay to completely rip off a website framework, layout, content etc, which in my opinion they have done, and that doesn’t really sit right with me. The main guy behind the site is Jon who runs it with his friend Derek, and they run an NHL Betting Tips website. They’ve take the entire concept etc from my own website BetNHL.ca. I attempted to contact them privately and deal with this in an amicable way. However I haven’t had a response from them over e-mail so I see no other option than to expose them publicly. 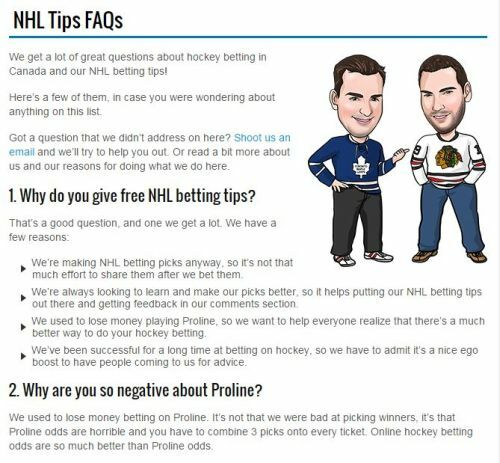 In December 2015, they launched their own NHL tips website. Now I’ve no problem with competing websites – it’s part of the business – but I do have a problem when – well let’s take a look at it. It’s NHLTips.ca if you wanted to see it for yourself. General framework of site taking up % of browser space on static background. Header area with logo and e-mail subscription box. 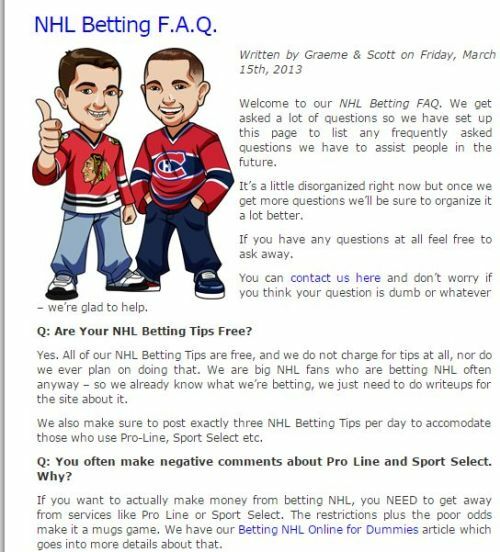 E-mail subscription box mentions “100% Free Daily NHL Tips” just like ours, and mentions Twitter/Facebook. Navigation bar right below header area then a banner. The mascots. The freaking mascots. The text on the homepage. From introducing themselves to talking about ProLine just like us. Latest NHL Tips listed in a bullet list. E-mail subscription box with mascots again inserted within the main content. Footer mentioning site is for entertainment purposes – just as ours mention. Did I mention the mascots yet? I think my favourite part is all the small things that are the same. Our favicon for the site? A hockey puck. Theirs? A hockey puck. Our e-mail address? site@betnhl.ca. Their e-mail address? site@theirsite.ca. We aim to offer 3 tips a day. They aim to offer….3 tips a day. Heck they even have a .ca domain. Why the hell not. I’m surprised they didn’t just switch the names around from “Graeme & Scott” to “Scott & Graeme”. I’m fine with competition. I’ve no issue with that. Hell, I take it as a complement when I see people use elements that I’ve created on their own sites. Believe me – this isn’t the first time I’ve seen a tips website featuring a mascot in a hockey jersey. However I don’t just randomly throw websites up and hope for the best. 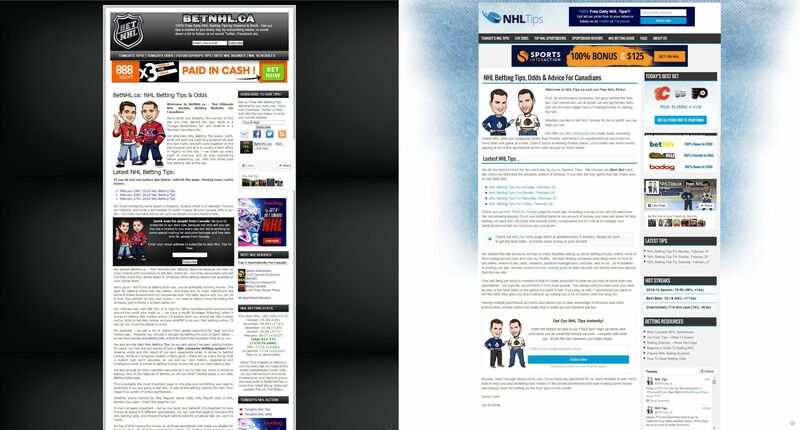 Everything about BetNHL.ca – from the layout to the wording to the CTA placement to the mascots – is from years of experience and hundreds of hours of split testing just within this specific niche. And then after all that hard work to have these two guys just step in, launch a website with the similarities mentioned above and then ignore me when I contact them? Yeah that just doesn’t sit right with me. This is a warning to affiliates and affiliate managers about making deals with these two, as well as any visitors to their website wondering about their credibility. You can make up your own opinions on them based on the examples above. This article was written on March 1, 2016 however all articles are looked at on a monthly basis and updated to keep them relevant.